The Šķēde dunes, where mass executions took place from October 1941 to spring of 1945, were a closed military area during the Soviet occupation, 1945–1991. When they finally became open to the public in the early 1990s, the mass graves were no longer recognizable from the ground. In 2004/2005, when the Foundation Liepāja Jewish Heritage, or LJH (Sergey Zaharjin, Ilya Segal, Ilana Ivanova) began planning the big Šķēde memorial, one of us (EA) urged them to look for the mass graves, and suggested 4 methods for locating them. However, LJH declined to do so, claiming that the graves had been washed out to sea during a big storm in 1957 that eroded the coast by 100–150 m. That seemed very unlikely, as the beach at Liepāja is exactly where it was in the 1930s and 1940s. The 1930–1988 maps in various archives also showed no evidence of such erosion. There exist nearly 7 million wartime German aerial photographs in UK and US archives, including more than 1000 of the Liepāja area, but all efforts to obtain them were unsuccessful. EA therefore obtained a photo of the Šķēde area taken in April 2003 by the US satellite Quickbird (Pict. 1). It shows a dark straight line (AE) 270 m long, close to and parallel to the coast. The location agrees with pictures of the Šķēde executions on 15 December 1941 as well as war crimes trial records, and the length agrees almost exactly with the dimensions 265 x 8 m reported by the Extraordinary Commission in 1945. Only 4 years later did we learn that the Russian State Archives in Moscow had the Commission’s maps of Šķēde (Pict. 2) and 2 other Liepāja murder sites. The grave is almost impossible to recognize from the ground, but EA measured the exact distances and directions from the satellite photo and gave them to the Liepāja geodesist Ints Liepiņš, who was able to find the grave without difficulty (Pict. 3, 4, 5). In January 2006 we asked the Mayor of Liepāja for permission to build a memorial plaque at the mass grave and to landscape the area. We hoped that survivors would then be able to walk up right to the edge of the grave—a deeply moving experience. However, the grave is on one of the „gray dunes“, which are very fragile and under strict environmental protection. Thus a raised wooden walkway would have to be built for visitors to prevent damage to the dunes. Under Latvian law, the walkway must be wide enough for wheelchairs, which would raise the cost even further beyond our means. Perhaps some wealthy donor will take over. The City proposed a less expensive solution: to set up a memorial plaque at the road fork between the old (Soviet obelisk) and new Šķēde monuments (giant menorah). Indeed, in 2005 a number of former Liepāja Jews had written to Mayor Sesks, urging him to ensure that the new monument acknowledge all victims murdered at Šķēde : Jews, Soviet POWs, and Latvians. The City agreed, assigned a special place for such a stone, and required LJH to install it, in return for permission to build the new monument. But LJH, shirking its obligation, never installed it. We and many fellow Liepāja Jews do not understand how Jews, though deeply indebted to rescuers of Jews and Red Army soldiers, can brazenly refuse to honor these non-Jewish victims who opposed the Nazis and were killed by them. We have therefore paid for the memorial plaque ourselves. The text, as approved by the City, is shown in Pict. 6. The plaque, installed on 27.10.06, is shown in Pict. 7. A Miracle in the Dunes! Ilana Ivanova, unwilling to face the fact that 3000+ anti-Nazi non-Jews were killed at Šķēde, angrily complained to one of us (VB) about our memorial plaque. In her view, Šķēde is an exclusively Jewish killing field, not to be defiled by mention of non-Jewish victims. Helpfully, a miracle occurred in 2009: 7 young, bushy pines emerged around our plaque, completely hiding it from view (Pict. 8). Alas, the City ruled such plantings, whether by heavenly or earthly causes, to be illegal and removed them. In a newspaper story (Latvijas Avīze, 7 Oct 2009), both Ilana Ivanova and Naum Vorobeichik, chairman of the Liepāja Jewish Community, say that they were “angry” about the placement of our plaque “right on the access path to the Menorah”. The latter also admits that the shrubs may have been planted by a local Jew. Yes, but the path forks at this point, the other branch going to the Soviet obelisk from the 1960s. Jews have long complained about Soviet Holocaust denial, referring to victims only as “peaceful Soviet citizens” without saying that many of them were Jews. Surely the obelisk needs the clarification provided by our plaque, but so does the Menorah, which mentions only Jews. It is sad beyond words that a woman, both of whose parents were saved by a brave Latvian couple and were liberated by the Red Army, gets “angry” about a small plaque honoring anti-Nazi Latvians and Russians lying in the same mass grave as Jews. Of course, it is all the fault of the Nazis who thoughtlessly dumped Jews and gentiles into the same grave. Wind Turbines on Mass Graves? 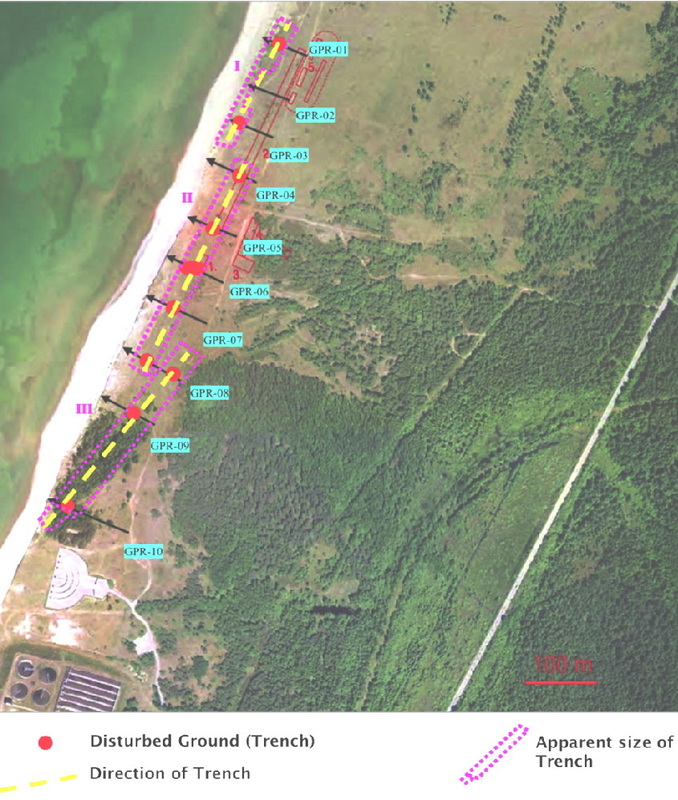 The consortium Rapsoil SIA (Ltd.), which wants to build 20+ wind turbines on the Šķēde dunes, had hired the environmental consulting firm Eiroprojekts to navigate the project through a thicket of environmental rules. The Liepāja Jewish Community (LJC) apparently did not know or care about our evidence for a mass grave, and in 2009 told Eiroprojekts to go ahead and build. We learned about the project only during public hearings in December 2009 and promptly submitted a map of the 10 graves in Pict. 1 and 2, showing that towers 20 and 23 would have to be moved inland by 100–200 m to prevent desecration of the graves. Now LJC, realizing their mistake, at last began to oppose the project, organizing a letter campaign by prominent people. Alas, the campaign was long on emotions but short on facts, arguing that the entire dunes area was “sacred ground”. The City, being responsive to facts, agreed with us and proposed a protected zone of 50 m around each grave. But Eiroprojekts fought back with wonderfully obscurantist arguments: “At the beginning of the Nazi occupation, north of the sewage treatment plant, on dates in December that are not precisely known, for a number of days that is not precisely known, at a place that is not precisely known, a number of civilians that is not precisely known, of a nationality that is not precisely known, were shot and buried near the shore”. Amazed by such inane, ignorant arguments we promptly rebutted them. But then Eiroprojekts went on a counterattack to prove that the mass graves did not exist. They asked the volunteer organization Leģenda, which specializes in finding WWII soldiers’ graves, to examine the putative grave in Pict. 1. Two men came and, using their standard technique for shallow soldiers’ graves, dug 4 small holes up to 1 m deep in what may or may not have been the right place. They had failed to consider that a 1 m hole cannot possibly reach a 3 m mass grave, so finding nothing, they claimed that “no mass grave was, or ever could have been, at that location.” But logic alone precludes such a categorical statement, by the old rule “absence of evidence is not evidence of absence”. We responded with a 3-page critique but realized that words alone would not suffice. As we had told LJH in 2005 to no effect, the best technique for finding graves is “ground-penetrating radar” or GPR, which is widely used to locate buried objects such as utility lines, graves, etc., at depths up to 10 m or more. At our request Prof. Valdis Segliņš and Drs. A. Kukela and G. Sičovs from Latvia University conducted such a study at Šķēde. The results are shown in Pict. 9. Graves reported by the Extraordinary Commission in 1945 are shown as thin red lines. Ten radar traverses (black arrows) were taken across the big ditch and its southward extension. Red dots mark disturbed ground to 3 m depth in the radar profiles. These red dots align linearly along the 3 yellow dashed lines and apparently mark 3 mass graves, outlined in purple in Pict. 9. Grave I lies along the northern half of the 270 m ditch, parallel to it but closer to the sea. Grave II coincides exactly with the southern half of the ditch but continues further south on its linear extension, and Grave III is still further south, reaching almost to the giant menorah. Further research is needed to define the graves more precisely and to confirm the presence of human bones. But it is already clear that the categorical denials by Eiroprojekts and Leģenda are contradicted by the GPR evidence. Further GPR surveys will be needed to delineate the full extent of the grave area, but there already are strong indications that a ~200 m strip along the coast should be placed under protection.